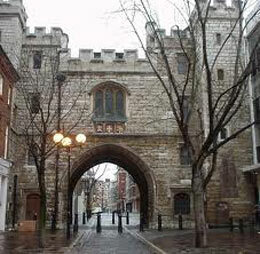 The ancient, hidden village of Clerkenwell clings to a hillside barely a stone’s throw away from St. Paul’s Cathedral. Its very name – the ‘clerks’, or ‘students’, spring – is redolent of antiquity; and indeed this tiny hamlet serves up brimming draughts from the deep well of its history. Mystery plays and plague pits; riots and rookeries; bodysnatching and bombing; jousting and jesters; bloodshed and burnings; monks, murder, and medicine: Clerkenwell has a tale or two to tell. Tracing its narrow alleyways and ancient squares, we take in here a Norman church; there a magnificent Tudor gateway; round that corner venerable Charterhouse, London’s only surviving mediaeval monastic complex; let alone Hercule Poirot’s London flat and the trendiest house in town. This walk is run as a pub walk. We will call in at two pubs en-route and end at one where you may spend as long as you like! I shall be leading this walk on Saturday November 26th 2016, meet St Paul’s tube station (Central Line), exit 2, 7.15pm.